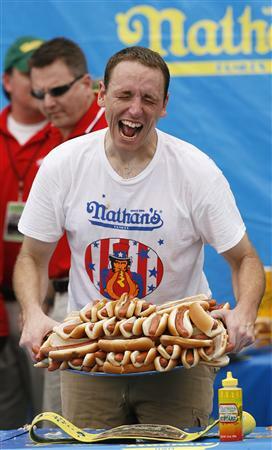 Itâ€™s not the 4th of July without the Coney Island Hot-Dog Eating Contest (thatâ€™s how we celebrate in Brooklyn, by stuffing our faces with as many hot dogs we can fit). 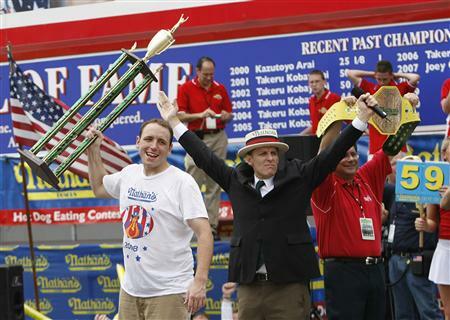 This yearâ€™s winner is defending champion Joey â€œJawsâ€� Chestunt, who won in overtime from six-time champion Takeru Kobayashi.World-record holder and defending champion Joey "Jaws" Chestnut held on to his hot dog-eating title Friday in an unprecedented tie-breaker at Nathan's Famous Fourth of July contest. 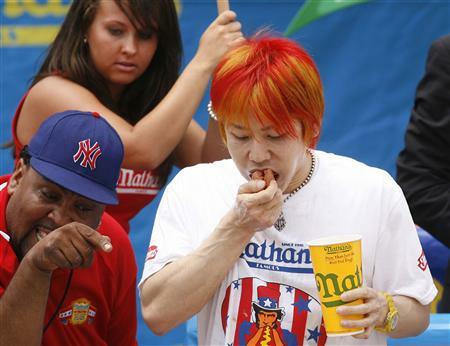 Chestnut, of San Jose, California, beat rival Takeru "The Tsunami" Kobayashi, of Japan, in a "dog off" in Coney Island where the two contestants battled to see who could finish five hot dogs first. 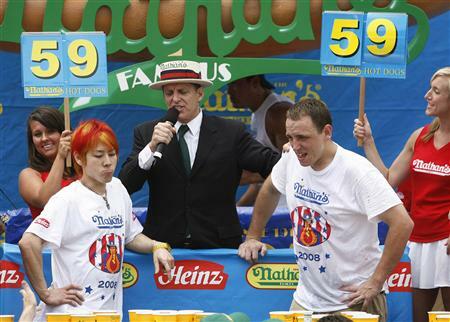 Chestnut and Kobayashi tied in the regulation competition, both eating 59 hot dogs and buns in 10 minutes, a record for a 10-minute competition. "It was a little messier than I wanted it be, but I got them in me and I got them down," Chestnut said after the competition. 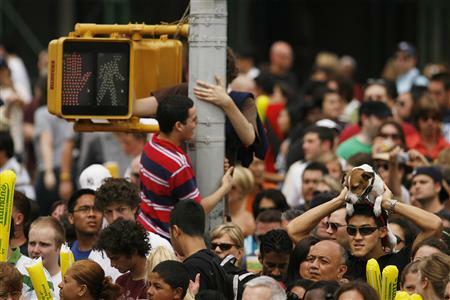 Organizers decided this year to change the contest from 12 minutes to 10 minutes after "a piece of old Brooklyn historical ephemera was found that stated that the first contest, held on July 4th, 1916, was a 10-minute contest," Major League Eating spokesman Ryan Nerz said. 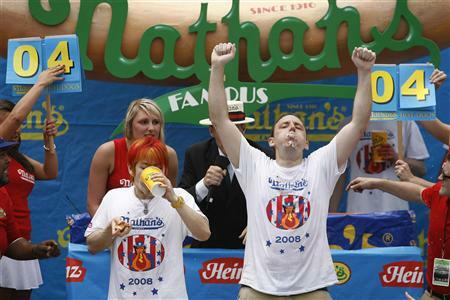 The previous record for a 10-minute contest was 42 hot dogs, held by Tim "Eater X" Janus, Nerz said. 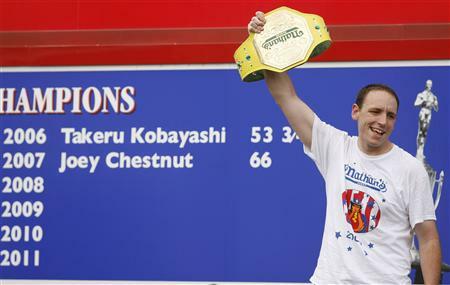 Neither Chestnut nor Kobayashi had previously competed in a 10-minute format. 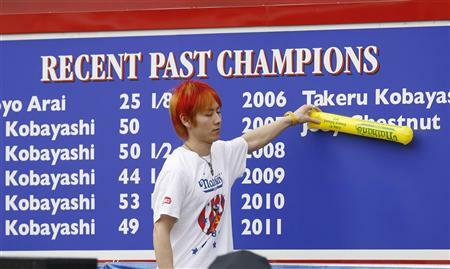 In last year's competition, Chestnut set a record by eating 66 franks in 12 minutes, ending Kobayshi's six-year reign as winner of the competition.